Hair care set brush & comb Charmmykitty sp./lacq. Photo Frame 13x18 cm w/Crown Icon Silver Pl w/Lacq. Kiddy cup Crown symbol, w/double handle silverpl.lacq. Charmmykitty is a white Persian cat that Hello Kitty received as a gift from her father. Charmmykitty’s grooming set contains a comb and a soft brush. All pieces can be engraved. The grooming set is silver-plated and lacquered, and therefore requires no polishing. Polished photo frame with a little crown. Suitable for a single 13x18 cm photograph. The photo frame is silver-plated and lacquered and requires no polishing. Silver plated lacquered kiddy cup with two handles, a drinking spout and a little crown. Can be engraved. Grooming set consisting of a comb and soft hairbrush. All pieces can be engraved. 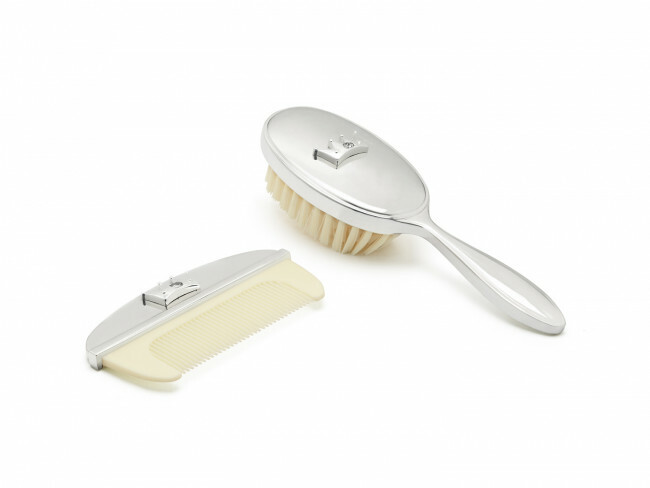 The grooming set is silver-plated and lacquered, and therefore requires no polishing.